Here is the recipe for The Most Popular Indian rather I should say Punjabi food - chicken tikka masala. This version is for those rainy days when u crave for chicken tikka but cant go outside and grill or maybe for those who wants to make this but their apartment management does not allow them to use patio grills. But whatever the reason is, the end result of this recipe is too good to be true. No one has ever said no for second helping for this one. So turn on your stove and make this amazing dish. 2 lbs of bonesless chicken thighs. and follow the directions for marination on the packet. I marinated the chicken for 3 hrs. Take 2 lbs of bonesless chicken thigh. Marinate it like u do for chicken tikka. 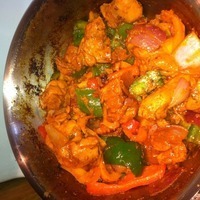 I use shaan chicken tikka masala half packet for 2 lbs chicken. Just follow the direction of the packet. I've marinated for 3 hrs. Heat some oil in pan, put marinated chicken and let it cook..the chicken should be soft and there should not be any water left in the pan. Take out the chicken from the pan. Put all peppers (green, red, orange, yellow) and onions in the same pan and let it saute for couple of minutes. Add chicken back to the onion pepper mix in the pan and turn off the heat. Squirt some lemon juice if u want or just serve it like this. P.S. swap the chicken for shrimps or paneer for variations.